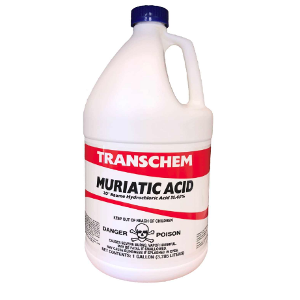 Professional Strength 31.45% HCL ( Muriatic Acid ). Excellent for pH reduction in swimming pools or to clean and etch masonry surfaces. Cleans and removes efflorescence from concrete surfaces. It is ultra pure and water white with unsurpassed quality to balance your pool water.